Phuket may be famous for its temples and gorgeous landscape, but there is more to the island than beaches and temples. Beneath the surface of the Andaman Sea hides gorgeous underwater scenery and the best diving experiences to be had. The diving experience in Phuket can be incredible indeed, especially since you can go on a variety of diving trips and have a blast. Before you start planning for your first diving trip to Phuket, however, here are some of the important things you need to know first. Phuket has a diving spot for everyone, but it is important that you choose a spot that suits your skill level perfectly. The more challenging spots are too dangerous for beginners; this isn’t something you want to take lightly at all. If you are not a certified diver, you can have an equally thrilling experience going snorkeling or visiting places where you can free-dive comfortably. If you are up for a challenge, there are also certification courses on the island. My personal favorite thing to do when visiting Phuket on a diving trip is the island’s liveaboard dive sites. If you’re like me and you enjoy spending time aboard a boat, you have a lot of places to explore. Spots like the Hin Daeng – with its gorgeous pink corals – and the Andaman Islands are all fascinating to explore. You can also visit Phuket’s long list of day-trip dive sites, including the Phi Phi Islands and the Racha Noi. You can also have a lot of fun visiting the King Cruiser Wreck before going back to Phi Phi for a relaxing afternoon. As you can see, the island has a lot to offer indeed. Spend some time researching the different diving spots you can access on your next trip to Phuket. You can then arrange the travel itinerary according to the diving experience you want to have. Even when your main goal of visiting Phuket is to have a great diving trip, the island still has so much to offer. This is why the accommodation you choose matters. You want to stay close to the beach and its beauty, but you also want easy access to other amenities on the island. Hotels in Mai Khao Beach Phuket, are among the best to look into. The properties in this area offer a nice balance between facilities, proximity to the beautiful beach, and price. I’d be surprised if you cannot find the perfect accommodation for your trip to this area. Lastly, Phuket is an island best experienced with friends or travel companions. 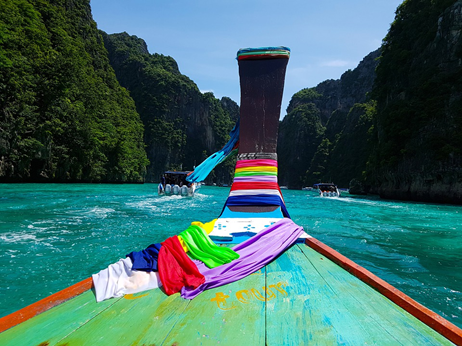 Going on diving trips in Phuket is also much more affordable when you are sharing the cost – such as the cost of renting a boat – with others who enjoy diving as well. Here’s the good news: you can find company even when traveling alone. If you think about it, that’s probably one of the best things about visiting Phuket (and Thailand in general). Thousands of people from around the world are going to the island to have as much fun as you.